Hunter Douglas Modern Precious Metals Literise (cordless) system makes this blind an excellent choice for children’s bedrooms. You are able to raise and lower the blind by simply lifting and lowering the bottom rail, thereby eliminating the lift cords. The Literise lifting system offers a cleaner look and safe environment. 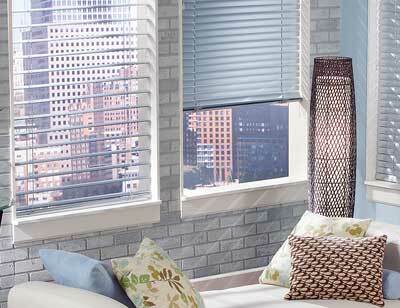 Aluminum blinds are an excellent selection for large windows as they are available in wide widths. If the reveal feature is added, it allows for the best view through in a horizontal product. Aluminum blinds are a lower price point then many other products and look great in a modern decor. Drop by today to speak with a professional Design Consultant about Modern Precious Metals at Sheila’s Window Toppers & More. . .250 Crowfoot Cres. N.W. With a larger opening, the Hunter Douglas Macro 2″ Aluminum blinds offer a dramatic look on larger windows. The Aluminum blinds feature a decorative valance and the “de-Light” feature, which hides cord holes to block more light. Premium, 8-gauge slats are made from an exclusive alloy with up to 85% recycled content and “bounce-back” to handle rough treatment of the Aluminum blinds. Reveal Hunter Douglas Aluminum blinds feature MagnaView, a new patented design that creates twice the view through of ordinary blinds. When tilted in the closed position, it resembles a regular Aluminum blind. 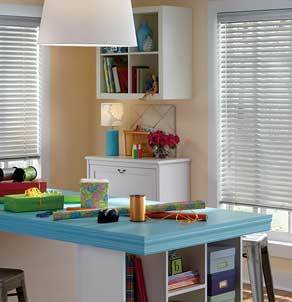 But when the Aluminum blinds are tilted open, slats combine together to provide larger opening for better lighting. 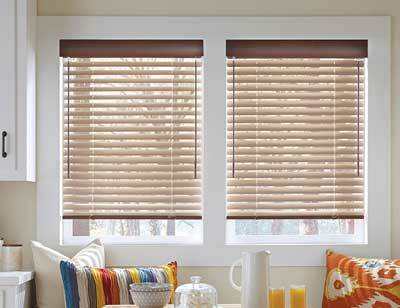 These blinds are only available in 2″ premium 8-gauge Aluminum slats and open to reveal a 4″ view through.